Date Nights are super important in keeping your marriage on track. Having the chance to get away for the evening and focus on each other can help spouses stay anchored together when work and family commitments have you feeling more like two ships passing in the night. But when the weather doesn't cooperate, or you can't book a babysitter don't let that stop you and your spouse from dating. Instead, put the kids to bed, put the emails away and have Date Night ~ IN! 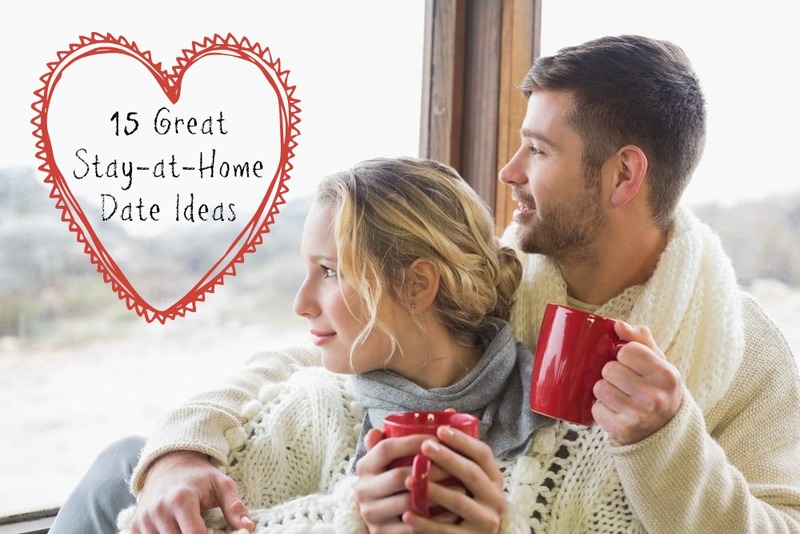 Here are 15 Great Stay-at-Home Date ideas to get you started. Play “Would You Rather?” You will learn a lot about a person that you never knew when they are faced with a crazy question . . .Here's a link to get you started. Watch a sports game together (or record one on the DVR and watch it together later). Eat nachos and hot dogs and cheer for your favorite team. Make bets on who will win and choose a fun prize for the winner. Give each other massages. Use Google or You Tube to learn some proper techniques and get to relaxing! Have a karaoke night! Find songs with lyrics on You Tube and sing your heart out. This is funniest if you can find some heart-wrenching ballads to belt out. Forget Wine and Cheese . . . how about a Chocolate Tasting night? You can get all the info right here, along with a cute printable to make it happen. Have a Video Game night. Bust out the Wii, the PlayStation, the Xbox or the Switch and throw down a challenge. Seriously, your husband will think you’re the best wife ever! Have a romantic candle light dinner. It doesn’t matter if you are eating hot dogs and macaroni and cheese . . . anything eaten by candlelight is romantic. Have a Fondue Night. Don’t have a fondue machine? No worries! You can melt chocolate or other dipping sauces in a slow cooker or even on your stove top! Check out this easy recipe for Rocky Road Fondue Dip dip. Write out the story of how you met (and fell in love). Better yet- video tape it! Your kids and future selves will be so grateful you did! A Year in Review. It’s always so fun to go back and remember all the things that have happened in the last year. Use THIS printable to easily record and remember all that has gone on in the last 12 months. Print THESE out and have a hilarious YouTube video-watching date night. There’s a Scavenger Hunt, a Try-Not-To-Laugh Challenge and a Vote for Your Favorite page. Pop some popcorn and get ready for some belly laughing! Have an INDOOR Snowball Fight. Baby, it’s cold outside! But you can still have an epic battle inside. Grab a couple nerf guns and make THESE fun targets to play. Have a Snowy Night Party Sneak outside (if you have kids, make sure they are asleep) and build a snowman or have a snowball fight. Come back inside when it gets too cold, make hot cocoa and warm up under some big blankets . . .